Ideal for engineers working full-time, the certificate can be completed in one or one-and-half years and equips students with the knowledge and skills to work effectively across AMD disciplines and domains. 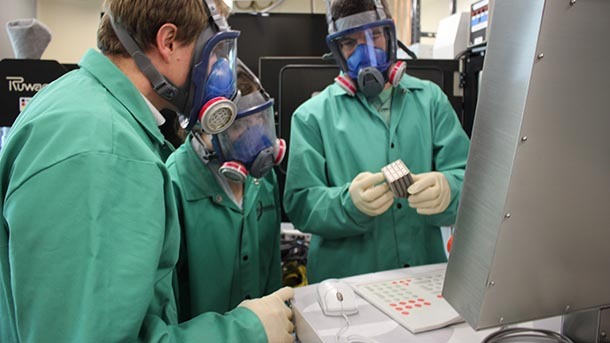 UNIVERSITY PARK, Pa. — Prompted by the incredible industry demand for trained experts in additive manufacturing and design for additive manufacturing, Penn State is offering a new graduate certificate in Additive Manufacturing and Design (AMD) through Penn State World Campus. Joining the University’s quickly expanding graduate program in AMD, the new 12-credit certificate provides a springboard for engineers to build a strong foundation in the thriving field. “We are finding that experienced engineers and designers in industry already have a graduate degree and aren’t looking to complete all of the coursework for another degree, yet they are anxious to learn about additive manufacturing and how it might affect their job, their company, or their industry,” Tim Simpson, the Paul Morrow Professor of Engineering Design and Manufacturing and the director of the Additive Manufacturing & Design Graduate Program, said. To capitalize on the field’s interdisciplinary emphasis, the AMD program at Penn State combines the strengths of the Departments of Mechanical and Nuclear Engineering; Industrial and Manufacturing Engineering; Engineering Science and Mechanics; School of Engineering Design, Technology, and Professional Programs; and Materials Science and Engineering; and spans two colleges, the Colleges of Engineering and Earth and Mineral Sciences. The admission requirements will be based on a combination of academic records, GRE scores, résumé and applicable work experience, a personal statement of interest, and three letters of recommendation from a professor or supervisor. GRE scores will be waived for applicants who have five or more years of work experience or who have previously completed a master’s degree. To receive the graduate certificate, students will complete three of the four offered 4-credit core courses in the existing AMD master’s program. The credits earned in pursuit of the certificate can also be applied toward a master’s degree in AMD if the student chooses to continue their education. Applicants will be expected to have a bachelor of science or four-year associate’s degree in engineering, engineering technology, manufacturing, materials science, or a related field. The program will launch in the spring of 2019 and is currently accepting applications. Interested students can apply for the spring semester until December 7, 2018. For more information, please email AMDProgram@psu.edu.